(Nanowerk News) The German branch of Friends of the Earth, Bund für Umwelt und Naturschutz Deutschland (BUND) has warned consumers not to buy a new type of washing machine that uses silver nanoparticles. Back in February, Samsung, one of the world's largest appliance and electronics manufacturers, introduced the world's first washing machine to employ what Samsung calls "SilverCare™ Technology". Samsung claims that the technology allows "over 100 quadrillion silver ions to penetrate deep into the fabric to sanitize clothing without the need for hot water or bleach". After launching the product in Germany, BUND criticized that considerable amounts of silver could enter sewage plants and seriously trouble the biologic purification process of the waste water. In addition, silver nanoparticles were blaimed to have a toxic effect on different kinds of cells. Helmut Horn, vice chairman of BUND, stated that in this case again, a new technology was released without carefully checking the risks in advance. Samsung countered that only an accumulated amount of 0.05 grams of silver are released per machine and year, while the released silver-ions quickly bind to non-nano-sized structures in the water. Therefore, the thread should be minimal.Any toxic effect of nanoparticles has to be considered together with the kind, size and modification of the particles. General predictions on the toxicity of nanoparticles are not possible. 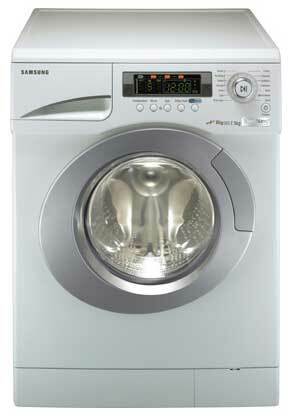 BUND wants Samsung to stop selling the new washer in Germany. Similar pressure by consumer activist organizations in Sweden already forced Samsung to take it off the market there. Consumers who already bought the appliance were told by Samsung to use the silver cycle "carefully".